5. 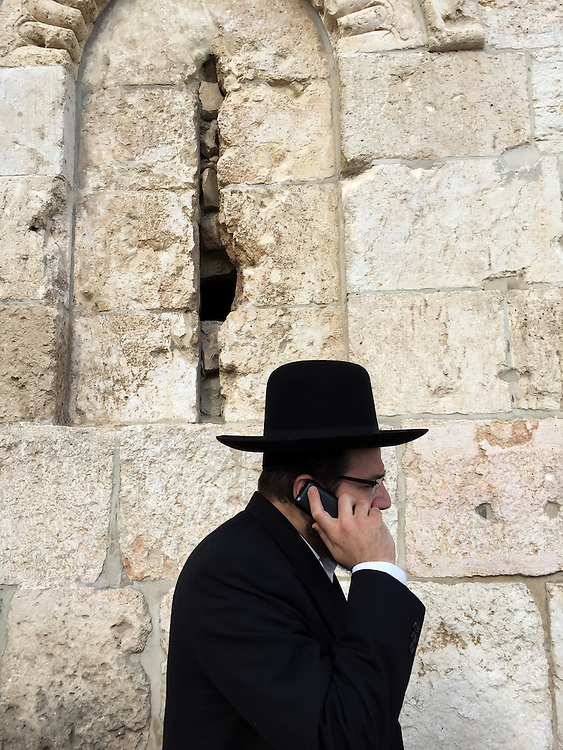 "Hasid (ultra-orthodox Jew) on Cell Phone": outside walls of the Old City, Jerusalem. At last we arrived in Jerusalem: the holiest city in the Holy Land. A Hasidic ultra-orthodox family was walking past the Old City's stone walls; father (the patriarch) on a cell phone, wife and sons at his side. According to Marc Rosenstein, an Israeli historian who is currently writing about my photographs, "The dissonance between the 'heavenly' and the 'earthly' Jerusalem" is perhaps the most pervasive of the oppositions that characterize Israel today. The issue, as Marc (and I) see it, is that there is an undeniable contradiction between what Jewish liturgy calls "the first flowering of our redemption," and "the presence of urban blight, pollution, corruption -- or even just of people going about their normal, quotidian, unmessianic lives...." This "compels attention," writes Marc. And I agree, having come to Israel on a spiritual quest to honor my parents, and now encountering so much more.